Information about condo finances for Albertans interested in buying a condo. Booklet features an overview of what documents to request and what to look for in the reserve fund documents, annual report, operating budget, financial statements, estoppel certificate, and meeting minutes. This booklet provides an overview of deposits, occupancy fees and other potential issues that may arise. Developers in Alberta are legally required to provide condo buyers with a number of documents before they sign on the dotted line. A list of documents you should request and review before you buy a resale condominium. Six things you need to know before you rent out your condominium. If you are a board member for the first time, here is a checklist and some tips to help you in your new role. Board members must follow standards of conduct in running the condominium corporation. There can be severe consequences if board members do not follow these standards. Bylaws are rules that govern the condominium corporation. The bylaws bind both the condominium corporation and owners. Anyone renting or visiting the condominium must also comply with the bylaws. As part of their duties under the Condominium Property Act, condo board members have the power to enforce the condominium corporation’s bylaws. 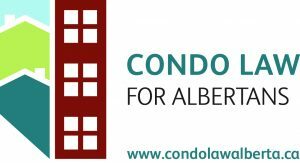 Here are some steps that a condo board can take if the bylaws are not followed. If a condominium is self-managed, the condo board is responsible for managing all day to day aspects of the property. Condominium contributions (also known as condo fees), special assessments, and reserve funds are different. Condo board members need to understand how they differ. Condominium corporations may need to provide certain documents to a unit owner or third parties (such as a unit purchaser or mortgagee). In Alberta, all condominium corporations must establish and maintain a reserve fund to cover the costs of major repair and replacement of its property. To determine how much money a condominium corporation should have in its reserve fund, it must complete a reserve fund study, report, and plan every 5 years. A condominium board of directors (known as the board) is a group of individuals. They are normally elected each year by unit owners to run the condominium corporation. Condominiums have 3 key meetings – board meetings, Annual General Meeting (AGM), and extraordinary general meetings. A condominium corporation has a legal obligation to respond to requests for certain information, depending on what is requested and who makes the request. Condominium boards should know that the Condominium Property Act (CPA) addresses the rental process, including what happens before, during, and after a tenancy.